The biggest match of Indian football is back as Kolkata giants East Bengal and Mohun Bagan face each other in a crucial I-League round 3 encounter on Saturday, 23rd January. The Kolkata derby is the definitive rivalry in Indian football and is regarded as one of biggest rivalries all over the world. The rivalry began 91 years back when East Bengal faced Mohun Bagan for the first time in history. The Red and Gold Brigade emerged victorious in that game 1-0. Till date the Kolkata giants have met each other 305 times in which East Bengal have won 115 times and Mohun Bagan 85 times. As the giants of Indian football lock horns on Saturday at the Salt Lake Stadium, we stride down the memory lane and take a look at 5 memorable Mohun Bagan vs East Bengal matches. It was a memorable encounter between the two fierce rivals as 7 goals were scored in a Kolkata derby match for the first time in history. The match had a different perspective altogether as Mohun Bagan legend Subrata Bhattacharya was at the helm of affairs at East Bengal. Mohun Bagan scored thrice in the first half thanks to P.C Lalwampuia, Jose Barreto, and S. Venkatesh. It was a one sided affair in the first 45 minutes as East Bengal looked helpless. Things changed drastically in the second half when Alvito D’Cunha showed sheer class and brilliance to score a quick brace in the beginning of the second half. S. Venkatesh then increased the lead further, but the drama reached a new level when Edmilson Marquez converted a penalty. A match which started with Bagan dominance ended in a neck to neck fight and became one of the most memorable matches in history. This is the most iconic match ever in the history of Kolkata derby as East Bengal thrashed Mohun Bagan 5-0 in the IFA Shield final. The goal scorers in this match were one of the prominent names of Indian football during 1970s era. Surajit Sengupta scored the opening goal and Shyam Thapa doubled the lead. Ranjit Mukherjee scored the third goal as East Bengal were in front in the first half by 3 goals. Shyam Thapa brought more misery for the opponents in the second half as he completed his brace. The rout was finally completed by Subhankar Sanyal in the 84th minute. It was possibly the happiest day of every East Bengal fans’ lives as it was their biggest win ever over their arch rivals. This I-League encounter will be remembered as a payback match for the Mariners as they scored 5 times to win this crucial encounter. 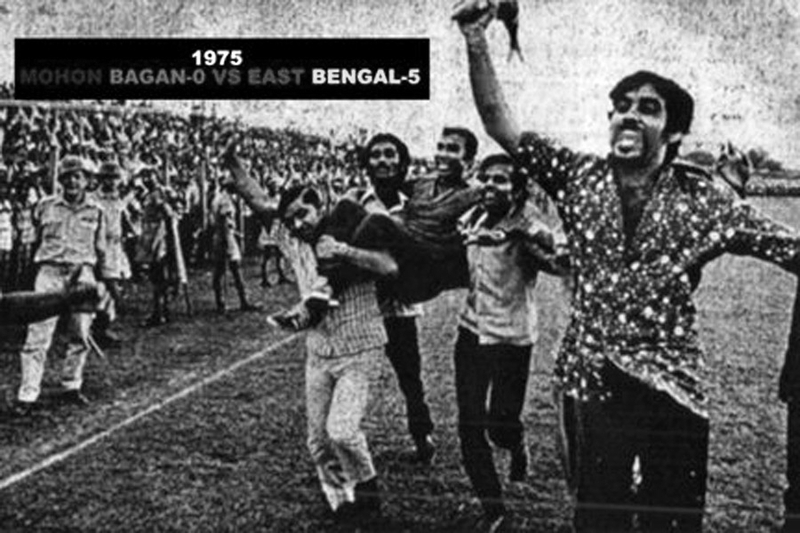 More than two decades East Bengal had registered a 5-0 win in 1975, which was used as huge source banter by the East Bengal fans till that day. Thanks to Edeh Chidi’s heroics, the Green and Maroon brigade took their long awaited revenge. The Nigerian Edeh Chidi scored 4 times, which was a record and Manish Maithani scored another one. For the opponents, Nirmal Chhetri, Srecko Mitrovic, and Yusuf Yakubu found the back of the net. This Federation Cup semi-final clash witnessed a record 1,20,000 people at the iconic Salt Lake stadium in Kolkata. It was a much-anticipated fight between the two iconic managers Amal Dutta (Mohun Bagan) and P.K Banerjee (East Bengal). Amal Dutta had revolutionized a new formation which Mohun Bagan playing in 3 back diamond formation with an ultra attacking approach. Mohun Bagan had defeated Churchill Brother 6-0 prior to that game and were high on confidence. But the day was meant for Indian football icon Bhaichung Bhutia who scored his first hat-trick. Nazimul Haque scored the other goal for East Bengal. For Mohun Bagan, Chima Okorie was the lone scorer. This match was extremely consequential for East Bengal as they completed ‘Hexa League’, that is, they won the CFL title six times in a row. The Red and Gold brigade were favorites before this game and a win on that day would ensure their 37th title. According to plan they completed their task in style as they thrashed arch-rivals Mohun Bagan 4-0, thanks to South Korean star Do Dong Hyun’s brace. He scored two world class free-kicks in the first half to seal the fate of the match. The other two goals were scored by Mohammad Rafique and Rahul Bheke. AUS vs IND 2016: Why should MS Dhoni step down from captaincy?